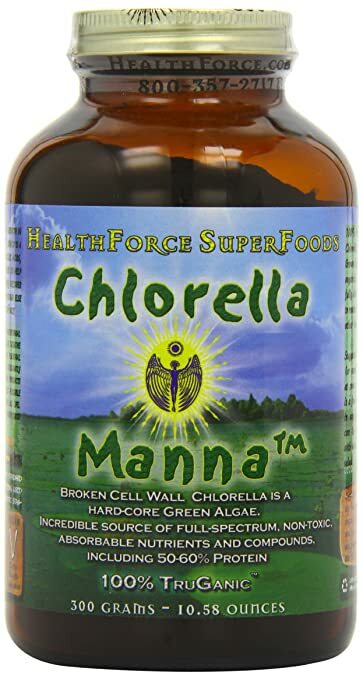 HealthForce Nutritionals’ Chlorella Manna is a broken cell wall chlorella available in the powder form.HealthForce Nutritionals is a 20-plus year, 100% hard-core, vegan, therapeutic superfoods company. 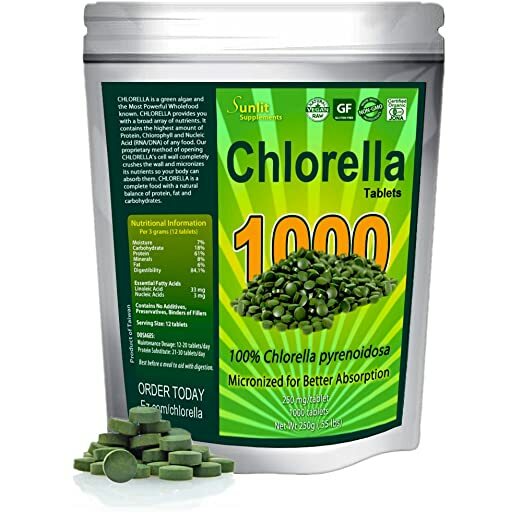 HealthForce Nutritionals cultivates its chlorella in indoor tanks, under a stringently controlled environment, following high standards of sterilization, thereby assuring you of a 100% pure, excellent quality product. It is free of contaminants and is radiation-free as well, as is confirmed by radiation testing. This 300 gm bottle of Chlorella Manna contains powder that is ground super fine, which makes it easier to absorb. The color is more vibrant than other brand powders and the taste is not unpleasant. It is gluten-free and is also suitable for vegans. 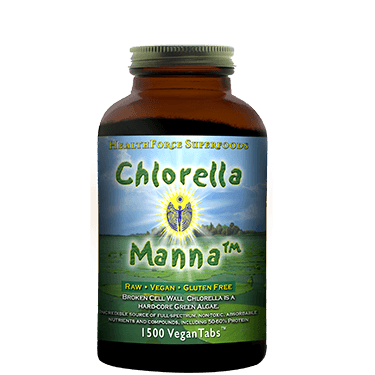 Chlorella Manna is a distinctive chlorella strain that is particularly rich in the Chlorella Growth Factor. Of course, similar to dark green chlorella that is cultivated outdoors, it is also densely packed with protein (50-60 %), chlorophyll, minerals, phytonutrients, vitamins, and beta-carotene. Sunlit Best Green Organics Chlorella Pyrensoidosa is 100 % pure, and one of the cleanest chlorella that is available. There are no additives, food colors, preservatives, coatings, artificial flavors, fillers used, and it is completely organic. Sourced from the premier micro-algae manufacturer in Taiwan, these superfood algae are completely grown in sunlight. It is grown under food safety-certified conditions, guaranteeing outstanding quality. This vegetarian superfood chlorella brand is packed with powerful nutrients, including protein (61 %), minerals, enzymes, vitamins, amino acids, fiber and Chlorella Growth Factor (CGF). This chlorella brand comes in the form of easy-to-swallow tablets. Each tablet is 250 grams. These tablets are also easy to digest because of a proprietary flash expansion process that is used to crack open the micro-algae cell walls. 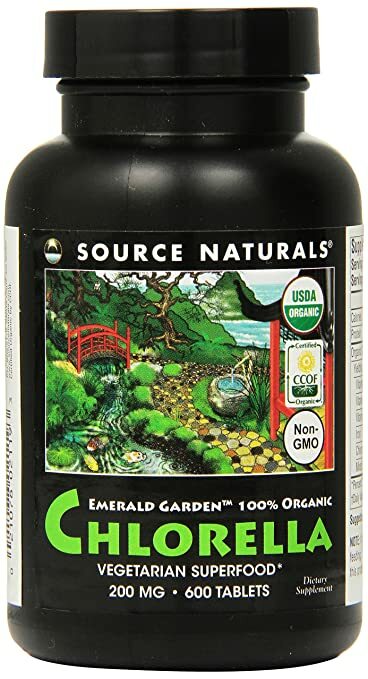 Source Naturals Emerald Garden Organic Chlorella is 100% pure, pesticide-free and contaminant-free, organic chlorella, and no fillers or binders used, as promised by Source Naturals. This organic chlorella is packed with are antioxidants, minerals, chlorophylls, vitamins, beta-carotene, naturally-occurring phytonutrients and fatty acids. Antioxidants help to undo the damage caused by free radicals. Phytonutrients help to keep your immune system strong and promote optimum cellular function and fatty acids support brain, heart and health. It also contains iron. This is an excellent brand of chlorella. Source Naturals has been around since 1982 and offers a wide-range of healthy products. This high quality brand offers good products at a solid price. Source Naturals Emerald Garden organic chlorella comes in the form of broken cell wall tablets, with each tablet of 200 mg.